Product prices and availability are accurate as of 2019-04-18 01:10:29 UTC and are subject to change. Any price and availability information displayed on http://www.amazon.com/ at the time of purchase will apply to the purchase of this product. 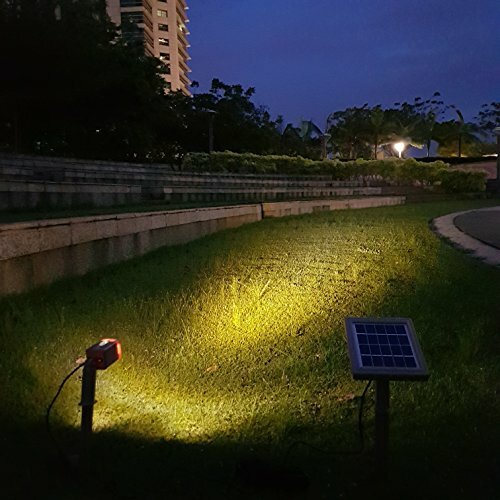 HEX 50X single solar spotlight comes with remote solar panel, high power LED, and optical technology that enables light beam traverses up to maximum 7m (23ft). Designed with bright warm white (3,000 K) light that similar to halogen light. 100 lumen per spotlight fixture. Walnut brown color blends in easily with tree trunck, natural stone wall, flower bed, and soil. 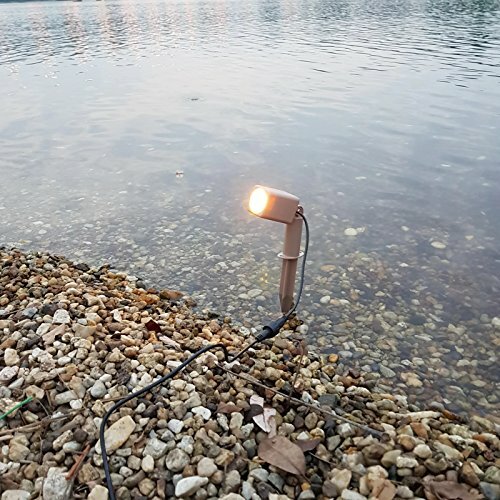 HEX 50X solar spotlight has a simplified lighting mechanism: plug-in the connectors and the light is turned on. How to check if the light is functioning upon received? i) Plug-in the connectors, place the solar panel face down or cover the solar cell with thick cardboard to simulate night time. ii) Check if the light comes on. The light comes with minimal battery power level to ensure safe transportation before reaching your home. 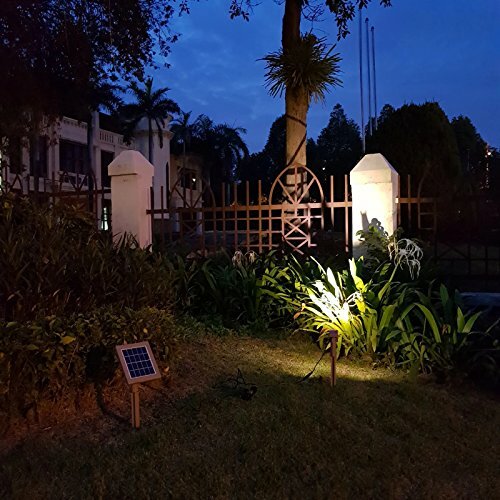 If the lights are functioning, please un-plug the connectors and charge the solar panel under full sun for 3 days before use. When the fixtures churn out shorter lighting hour in subsequent days, please check the location of your solar panel to ensure there is no partial shade on solar cell during any time of the day. 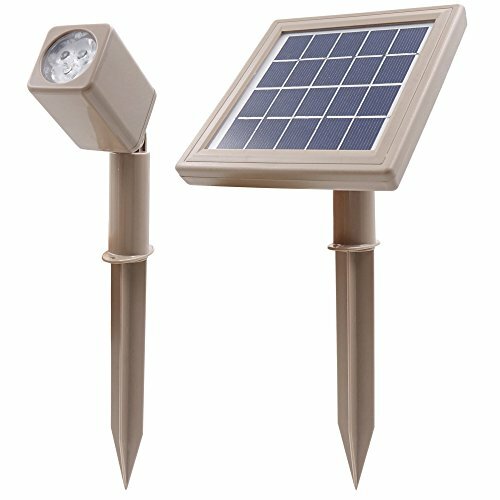 Shift the solar panel location for optimum sunlight exposure. 100 lumen single spotlight fixture. Warm white LED (3,000 K) with special magnifier lens, output angle 45-degree to cover wider angle area than average light fixture. Sleek walnut brown finish spotlight fixture, small profile. Minimal footprint, less visually obtrusive. High efficiency solar power conversation photovoltaic cell & Lithium battery for improved performance. 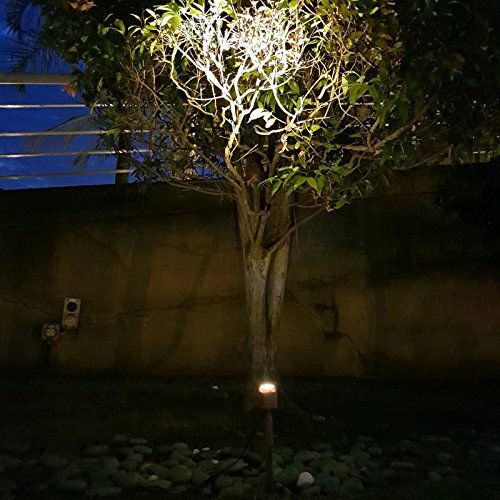 Built for outdoor, IP65. Lasts 6-8 hours on a full charge. Suitable for garden accents, walkways, small landscape edging or border plants. 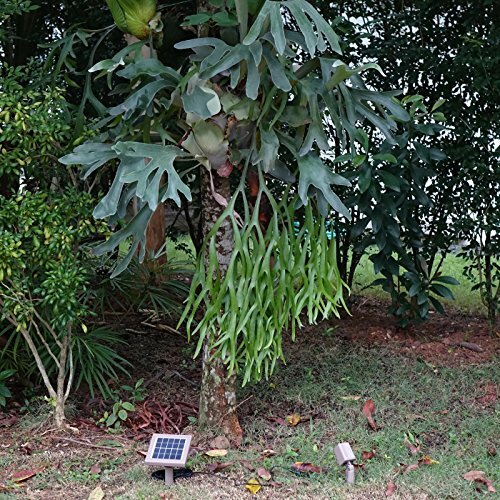 Solar panel to spotlight cable length 5m (16ft). Total cable length 5m (16ft). Optional extension cable is available in store. Make sure to un-plug the connectors and charge the solar panel in full sun for 8 hours before use. When the light does not perform accordingly, please un-plug the system and charge in full sun for 3 days before use. Low battery power prohibits system to function normally.